← Happen to Have $250k for a “Rare” 1775 Medal? Posted on April 29, 2013, in Insignia and Devices, Rates and Ranks, Shoulder Sleeve Insignia and Patches, US Navy, World War I, World War II and tagged Enlisted Ranks of the U.S. Navy, Hospital Corpsman, Jumper Uniform, Metalsmith, Mineman, Navy Crows, Navy Ratings, Navy Uniform Regulations, Pharmacist's Mate, Radarman, Radioman, Rating Badges, Ship Fitter, Ship's Cook, Signalman, Torpedoman's Mate, US Navy. Bookmark the permalink. 18 Comments. From your description of your uncle’s rating badge, it sounds as though he was an Electrician’s Mate, 2nd Class (EM2/C). His badge looks like this, but with two red chevrons rather than this single-chevron of an EM3/C. I have a rating badge I have been unable to identify. 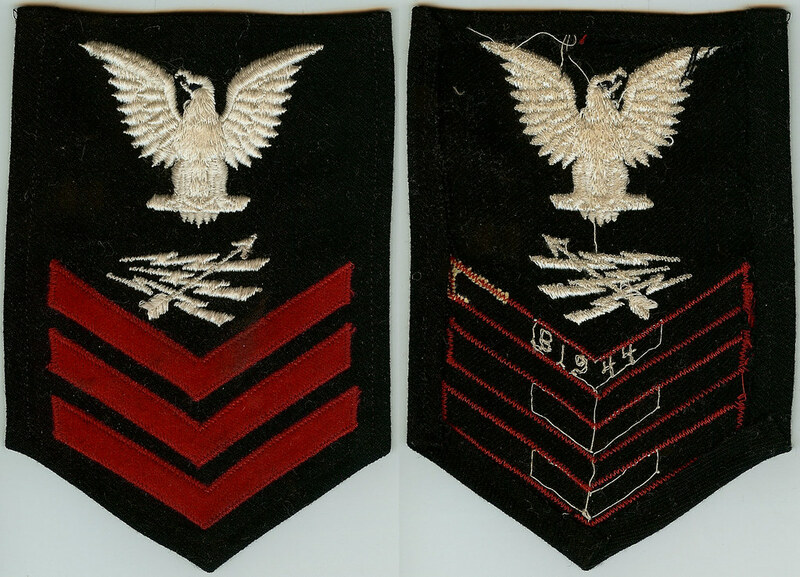 I know it is a Petty Officer First Class (three chevrons) but the insignia is a crossed quill and laurel branch below a key. The rating badge that you are describing is a U.S. Coast Guard rating badge. 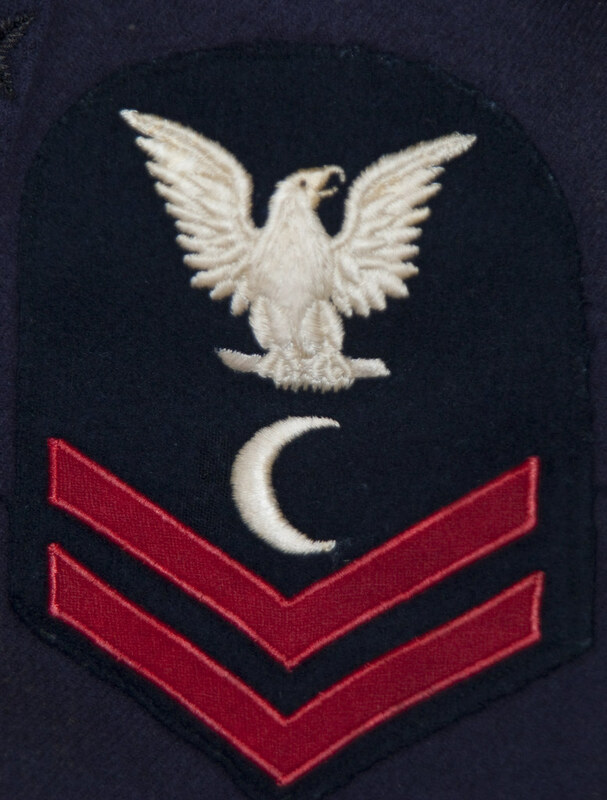 The rating, Food Service Specialist (or, “Subsistence Specialist” as it was known from 1974-1996) is currently in use within the ranks of the USCG service. Hello, I have what appears to be a chief petty officer patch – a ships wheel for the rating/job speciality – the patch itself is red, with blue chevrons and perch, and a white eagle, and white ships wheel. It has not been trimmed, and it still has a tag on it from “Stewart & Co” from Baltimore, Md. Someone suggested it may be Spanish American War era, as much as I would like to think that to be the case, it is in much too good shape for me to believe it without some sort of verification. Are you able to offer any insight? – I can send a picture if it would help. 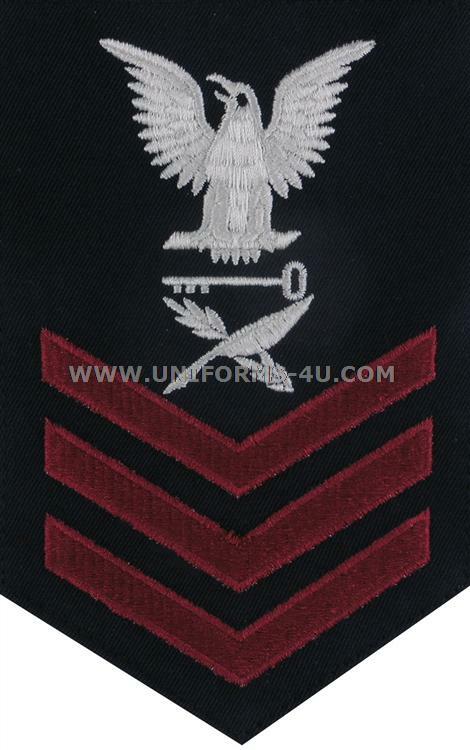 Why do navy, coast guard and air force chevrons point down while all other chevrons point up? with the eagle facing this same direction (opposite of current rates). If you are patient, you will find the right one for your box. My late father was a Fireman 1st class in WWII.One web site said that the rank patch of 3 red stripes wasn’t used until the 50’s. Is this correct? Thank you for any assistance. My grandfather was a wireless operator in WWI and WWII. I’m trying to find out his rank. 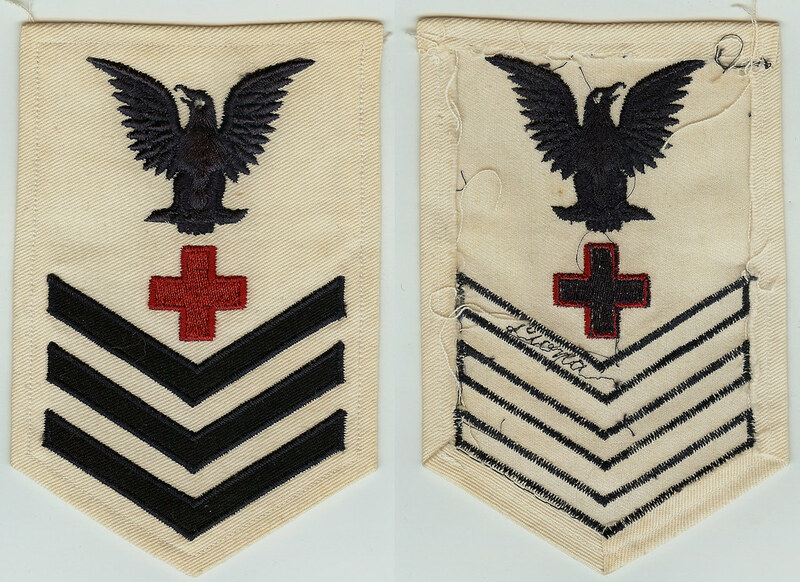 In your image of pre-1913 dress white Navy rating badges, his rating appears to be like that one at bottom left, an oval between the Eagle and the chevrons. Can you help? Mike, if you email me a photo of his rating badge to “USNaval.Collector at gmail.com” (obviously, replace “at”) with @). You mention, in your description of the RD badge up date that the RM sparks were replaced with the oscillator symbol and arrow. That is not an oscillator, it is an oscilloscope with a waveform display. Probably the very first scope, prior to motor driven rotating antennas. That scope continued to be used in other applications, such as the “A” scope, used for ECM signal reception and analyzing. Thank you for taking the time to correct my error. I do know the difference between an oscillator and oscilloscope. Though we never used the oscilloscope during my service as an OS (NTDS-OJ-194/OJ-197), my mistake on that post is unforgivable despite correctly describing the rating symbol in the image caption below the error. I will make the correction to the story. If I may, I am assuming that by the manner of your comment, you were and RD/OS. Is this correct? When did you serve? 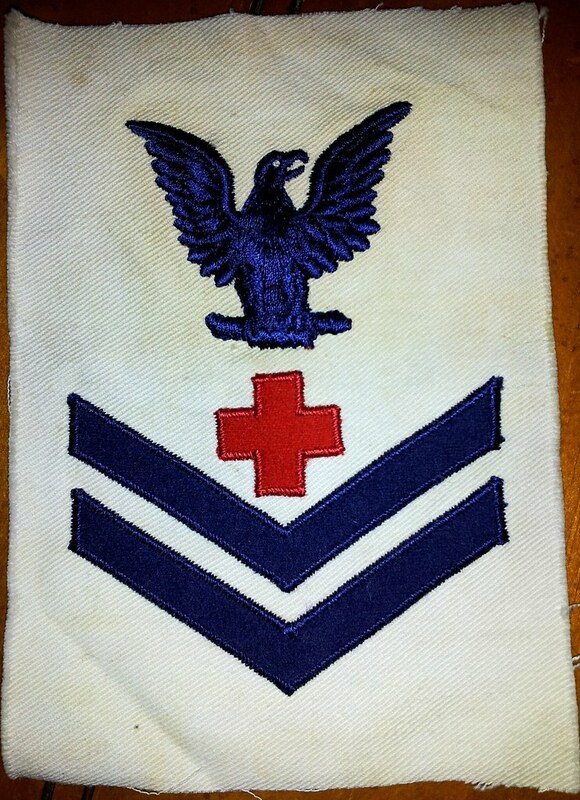 I have my grandfathers Navy badge but cannot find it anywhere. The eagle is facing right and is over what looks like a bomb ( or perhaps a torpedo). Those are white and then there are 3 red stripes below . Can you tell me what it means please? Thank you for reaching out and for visiting The Veteran’s Collection. Your description is most-likely a rating badge for a Torpedoman’s Mate First Class (TM 1/c). In today’s pay and ranking structure, this would be the equivalent of an E-6, first class petty officer. Your grandfather’s next advancement grade would have been to a chief petty officer or, more specifically, Chief Torpedoman’s Mate or a CTM. The right-facing eagle dates the badge to pre-1946.